Investing.com – The U.S. dollar fell against its rivals on softer U.S. economic data and an uptick in the euro on the back of hawkish comments from European Central Bank policymakers. The U.S. dollar index, which measures the greenback’s strength against a trade-weighted basket of six major currencies, fell by 0.33% to 93.54. U.S. worker productivity rose more slowly than analysts had anticipated in the first-three months, scaling back some of the bullish expectations for stronger labor market growth which had followed the release of an upbeat jobs data released Friday. 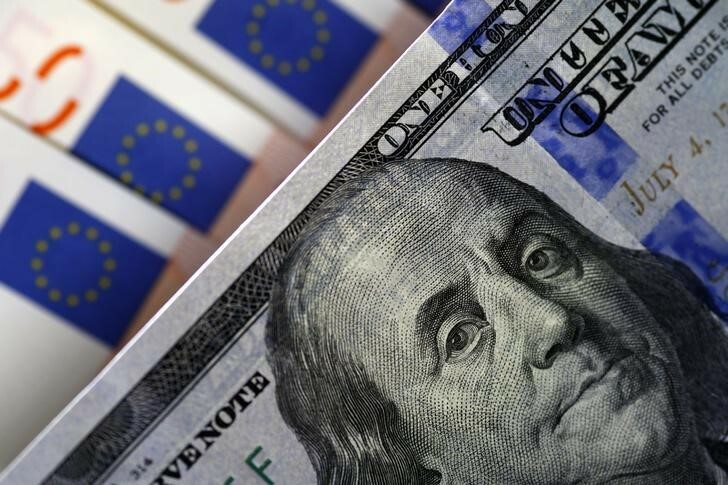 The dollar was mainly held back, however, by a surge in EUR/USD to $1.1782, up 0.69%, as European Central Bank (ECB) policymakers stoked expectations the ECB would tighten monetary policy sooner rather than later. ECB chief economist Peter Praet said on Wednesday the central bank would next week debate whether to cut bond purchases gradually, Reuters reported. The single currency was also bolster by falling political uncertainty in Italy. GBP/USD rose 0.20% while USD/CAD fell 0.35% to C$1.2925, amid reports US Treasury Secretary Steven Mnuchin urged President Trump to exempt Canada from steel and aluminium tariffs. USD/JPY rose 0.20% to Y110.06 as risk-on sentiment reduced demand for safe-haven yen.